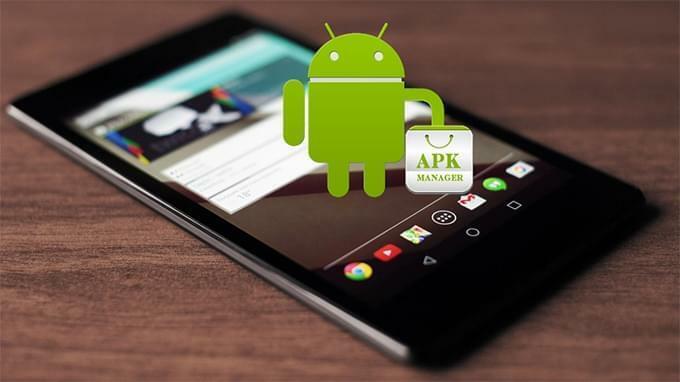 APK is a package file format used to install application software on Android operating system. Usually, they come in the form of apps. It is true that the Google Play Store is literally filled with millions of applications from top games apps to productivity apps. But why does someone ask about how to install APK on Android? Actually, not all apps can be found on Google Play Store especially those apps which are not available in Android market or outdated. Given this, if you want to install apps that are not officially released yet, you need to learn how to install apps on your android gadgets. When you have acquired APK files outside of Google Play Store, be aware that your phone is authorized to support installing third party applications. 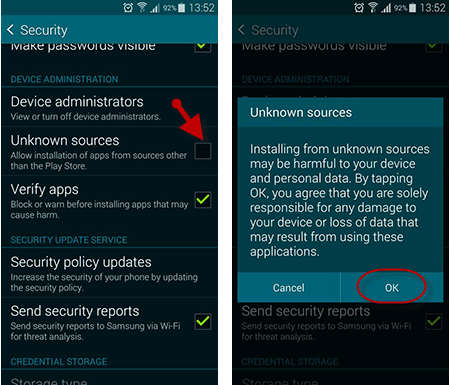 By default, android smartphones do not allow installation of third party apps, only those that are sourced from Google Play Store are permissible. Luckily, you can tweak this setting by going to “Menu” > “Settings” > “Security” > check “Unknown Sources”. After completing the above steps, you can now install APK on android from PC. Just connect your smartphone to computer via USB cable and select “Media device” when prompted. Then, open your phone’s folder on your PC and copy the APK file you want to install. Simply tap the APK file on your handset to facilitate installation. You can also install APK files from your phone’s browser. Just find the APK that you want and download it directly on your phone. Once done, open your “Downloads” folder and tap the file to install. If you prefer a better way to organize your apps, there’s another option left. You are able to use third party versatile software to install APK on Android. Even if you have transferred the file on your handset, without the built-in package manager, you won’t be able to install it. This is where third-party software comes in handy. They’ve got a reliable package manager for you to install apps on both phone memory and SD card. Moreover, they are easier to use when compared with the manual method. By using the latest technology on when it comes to file transferring and installation, AirMore is your to-go application. This app allows you to transfer all types of mobile files including APK from your phone to PC or vice versa. Best of all, you can transfer or install files without the use of USB cables. AirMore is 100% free to use with no limits or registrations required. Furthermore, you don’t need to install the software on your computer, everything is done in your browser alone. 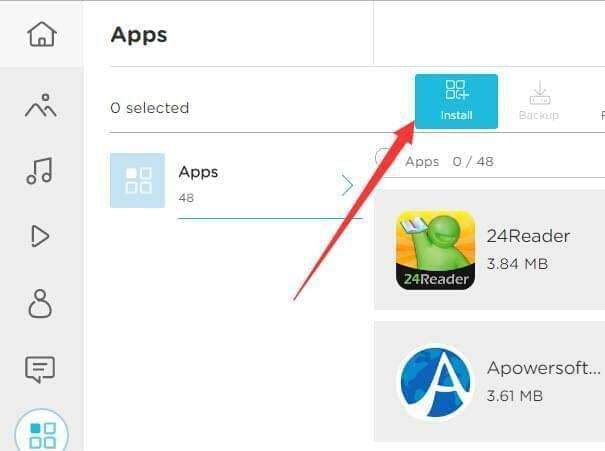 Here’s how to use this APK installer for Android. Go to Google Play and download the application on your phone. On your PC browser, go to AirMore official website and click the “Launch AirMore Web to Connect” button or directly type in “web.airmore.com“. Open the app on your phone then tap “Scan to connect”. Scan the QR code displayed on the web or click your device in Radar. If you’d like to connect in Radar, then hit “Accept” on your phone when a dialog box pops out. To install APK on android from PC, simply click the “Apps” button on the upper side. Next, click the “Install” button which is located on the top pane. Then, locate the APK file you wish to install and click “Ok”. Yes, you can manage all the mobile data from your PC wirelessly with such great ease. Bear in mind that both your device and the computer should be connected to the same network before you can transfer or install files wirelessly. Besides being able to install apps, you can also utilize it to uninstall the apps from Android. In addition, this app is also filled with extreme features you would surely enjoy such as phone to PC screen projection, file back/restoration and much more. Download and install the program from Google Play Store. Connect your handset to PC via wireless connection or USB cable. Once connected, open the interface and click the “Apps” button on top. Click the “Install” button and locate the APK file on your PC, then wait until process completes. There are many ways on how to install APK files on Android. 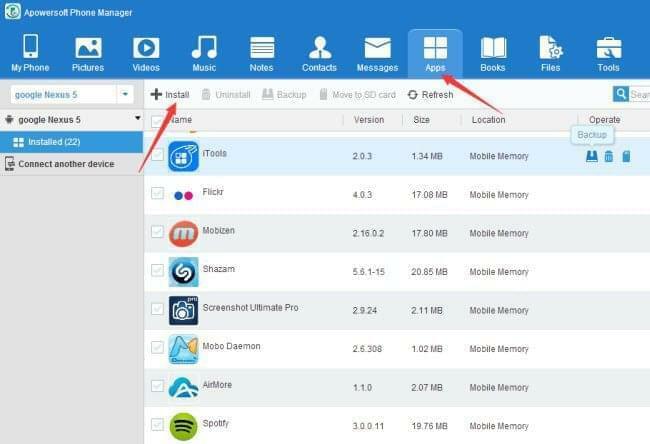 The beauty of using AirMore is that it enables you to manage files over the air, and it comes with a sleek vibrant-looking interface. Though, bear in mind that there are no other connection options available other than Wi-Fi so you need to have a stable internet connection. If you’re willing to access your mobile with more flexible options, Apowersoft Phone Manager will be your best bet. You may choose the best one as per your needs. Nice. Thanks. Tried couple other methods but Install feature is a help. I really want to thank you for this valuable article. Actually, I don't know how to install an Apk on Android device. This article teaches me.Thank you again. Thank you so much you helped me alot! !